Keith talked about many new things happening this year including special guests Corin Nemec and J.M. Dematteis and his Kickstarter to help bring more awareness to the convention and his work, a comic called The Mighty Mascots. 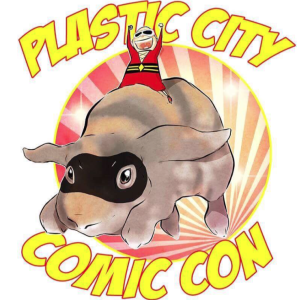 One of the most important aspects about Plastic City Comic Con is that they have no intention of moving to a multi-day format or new location for the foreseeable future. The thinking behind that is to keep costs low for the participants as well as attendees. In this respect, Keith is working very hard to commit to the Micro-Con concept and the fact that this is their third year is proof that the Micro-Con is a very viable option for all and tons of fun. Join Sci Fi Saturday Night there and say hi.